The indigenes of Anambra State living in the United States, Canada, Japan, United Kingdom and South Africa have collectively conferred the “Peoples’ Choice Award” on the governor of the state, Chief Willie Obiano for putting up an excellent performance in office in the last 100 days. 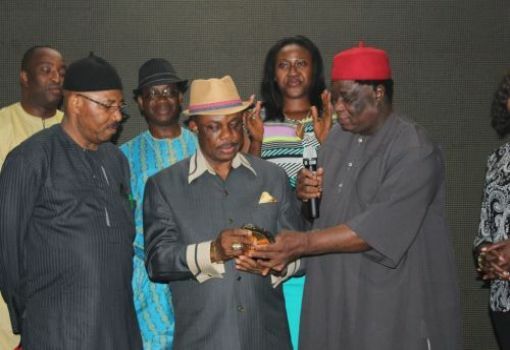 The indigenes who came together under the umbrella of Anambra State Association ASA-World conferred the award on Governor Obiano at a dinner at the Governor’s Lodge, Amawbia held in honour of the Anambra State Association in the United State of America (ASA-USA) Women’s Wing who have been in the state on a medical mission. Conferring the award on Chief Obiano, the President of ASA World, Dr. Nwachukwu Anakwenze commended the governor for his outstanding performance in office in the last 100 days and turning the tide against hoodlums that had hitherto grounded all development efforts in the state. According to him, Governor Obiano’s performance has inspired confidence that the state was on rebound, pointing out that ASA World would do whatever it could to give him the support he needed to expand the frontiers of development in the state. Dr Anakwenze further stated that with Obiano’s purposeful leadership, Anambra would soon regain its pride of place as a frontline state in Nigeria and the pride of the Igbo race. He urged Ndi Anambra at home and in the Diaspora to come together and lend a hand in the on-going efforts by the Obiano administration to fast track development in the state. Leaders of the association in the UK, Canada, Japan and South Africa also spoke in the same vein, assuring the governor of their support to move the state forward while the President of ASA South Africa, Mr. Frank Anyeche used the opportunity to announce that his branch of the association had set up a scholarship fund for the best secondary school students from each of the 21 local government areas of the state. Mr Anyeche explained that the scholarship was set up as part of the collective effort to support the governor’s bold strides to revamp the education sector in the state. Speaking in a similar vein, the President of ASA-USA, Women’s Wing, Dr. Mrs Uche Umeh announced that the group was planning to build a world-class Cancer Centre in Awka, the State capital for which the State government had already provided land for the project and further commended the administration for his proactive measures to reposition the State. Dr. Mrs Umeh pointed out that the Association would partner with investors to fund the project as part of comprehensive plan to tackle the cancer scourge and provide relief to the victims, while calling for calibration of the mammography machines at Amaku Awka and Onitsha General Hospitals to facilitate easy screening of breast cancer. She explained that their medical mission covered seven towns across the State with about 5,000 patients benefitting from their free medical services which, she said, focused on cancer screening, surgery and enlightenment to create awareness on preventive measures, adding that women with lumps were admitted to the hospital for a surgical intervention. Responding to the award conferred on him, Governor Obiano thanked the members of ASA-World for considering him worthy of the honour. The governor assured them that the gesture would spur him on to rise to his full length and lift the state to a higher level of development. Governor Obiano however reminded the members of the association of the need to always remember where they come from while enjoying the comforts of life in the Diaspora urging them to think home and channel some of their resources to the State to identify with the new development initiatives of his government to launch the State into the orbit of sustainable development. The governor also explained that the unrelenting onslaught against criminals has created a conducive environment for investments and businesses to flourish, stressing that a successful implementation of his four pillars of development and their enablers would open up fresh frontiers of economic activities, food security, wealth creation and employment opportunities. He assured that the tempo of crime fighting would be sustained throughout the lifespan of his administration to build strong and sustainable structures that would bring down the crime rate in the state. Governor Obiano later presented certificates of honour to some students of British Spring College, a privately-owned school in Awka for singing the State Anthem during the presentation of the brand Anambra Coat of Arms to Ndi Anambra in Diaspora and announced a one million Naira reward to their school.